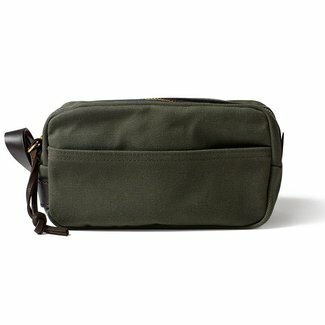 Filson Travel Kit Navy is a water-repellent travel kit which..
Filson Travel Kit Otter Green is a water-repellent travel ki..
Filson Travel Kit Tan is a water-repellent travel kit which ..
Filson Original Briefcase Otter Green is also lovingly known..
Filson Original Briefcase Tan is also lovingly known as the ..
Filson Original Briefcase Navy is also lovingly known as the..
Filson Small Duffle Bag in Tan is their most iconic duffle t..
Filson Small Duffle Bag in Navy is their most iconic duffle ..
Filson Small Duffle Bag in Otter Green is their most iconic ..
Filson 24-hour Tin Cloth Briefcase Otter Green is also lovin..
Filson 24-hour Tin Cloth Briefcase Black is also lovingly kn..
Filson 24-hour Tin Cloth Briefcase Navy is also lovingly kno..
Filson 24-hour Tin Cloth Briefcase Tan is also lovingly know..
Filson Journeyman Backpack Tan is made in Filson's signature..
Filson Journeyman Backpack Otter Green is made in Filson's s..
Filson Medium Duffle Bag in Otter Green is their most iconic..
Filson Medium Duffle Bag in Navy is their most iconic duffle..
Filson Padded Computer Bag Otter Green is also lovingly know..
Filson Padded Computer Bag Brown is also lovingly known as t..
Filson Padded Computer Bag Tan is also lovingly known as the..
Filson Padded Computer Bag Navy is also lovingly known as th..
Filson 48-hour Duffle Bag Otter Green is their most iconic w..
Filson 48-hour Duffle Bag Otter Black is their most iconic w..
Filson 48-hour Duffle Bag Navy is their most iconic weekend .. 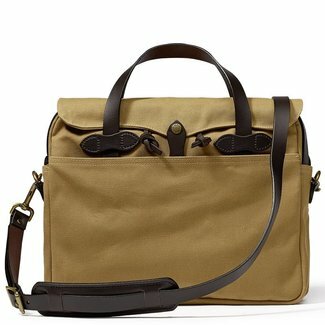 The long history of Filson starts with American C.C. 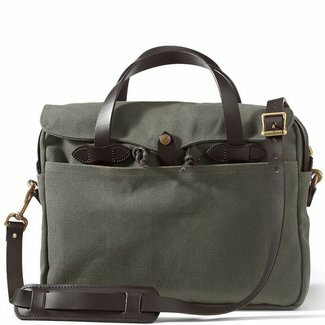 Filson, born in 1850. He was a pioneer with a big love for the outdoor life. The first part of his life, he worked as a railway employee. In 1890, he moved to the small town of Seattle, Washington. After having worked in a small outdoor store in Seattle for a couple of years, he got enough experience to do it better himself. America was in the middle of the Great Klondike Gold Rush, so there was a big demand for working clothes and accessories. In 1897, the pioneer started his own company with the name C.C. 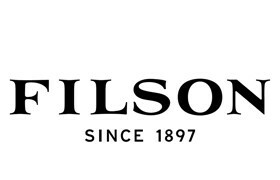 Filson’s Pioneer Alaska Clothing and Blanket Manufacturers. He used the stories of the gold miners’ distressing and pitiful working conditions to design products. Products that eased the harsh working conditions of a gold miner. 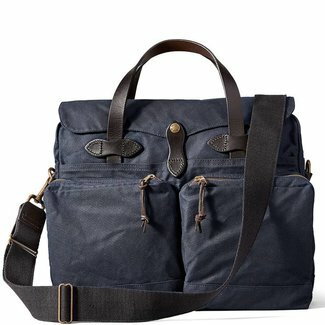 Filson produced the outdoor clothing and other necessities himself and stayed in close contact with his customers so that he could continue developing his products. 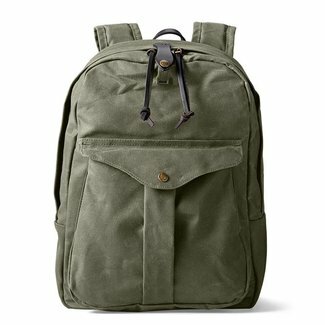 After the Gold Rush ended, Filson stayed a specialist in outdoor products for hunters, fishermen, engineers, sailors, mine workers, and explorers. 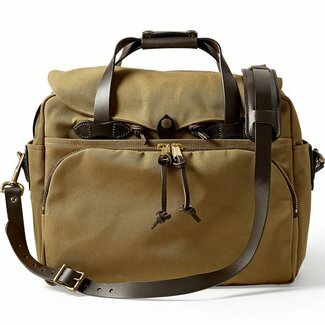 Around the 1960s, Filson became known worldwide as the best outdoor brand. 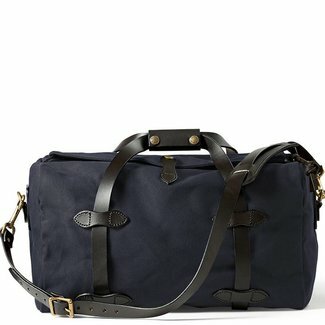 Nowadays, Filson has reached the Netherlands and the brand is gaining more and more popularity. Three materials have been developed by the brand that are still in use today. Comfort, protection and durability were the leading factors in the development of the materials. The fabrics had to be suitable for the roughest conditions. - Tin Cloth is thick, cotton canvas, made in the old mills of Scotland. Back then, the material was provided with an oil finish wax. Later, they stopped using the wax and today it is an oil finish that provides protection. - Mackinaw wool is a heavy wool type that is water-repellent. - Rugged Twill is a heavy rough cotton canvas that is lightly brushed with wax on a paraffin base to make the fabric water-repellent and reduces the chance of loose threads. With Filson bags, you do not have to worry about complicated outdoor bags that can only be used for outdoor activities. Nowadays, the bags are also suitable for everyday use. 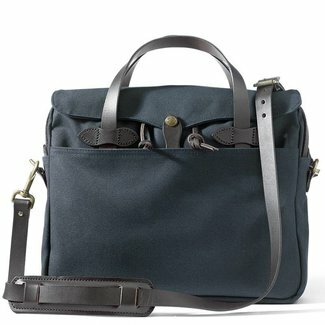 All Filson bags meet the leading factors of comfort, protection and durability. 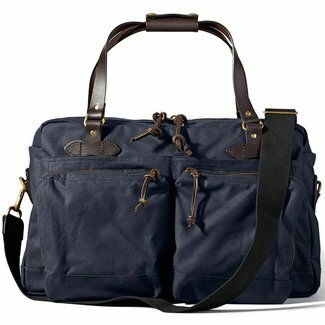 The bags are made from Rugged Twill, a type of cotton that is water-repellent due to the wax layer. 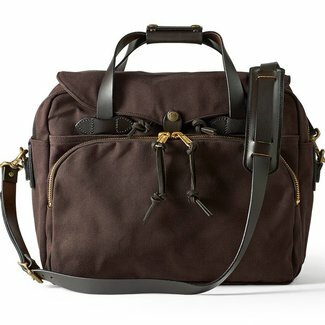 In addition, the accessories have leather details such as the shoulder strap and the handles. Furthermore, each bag has a solid brass YKK zipper. 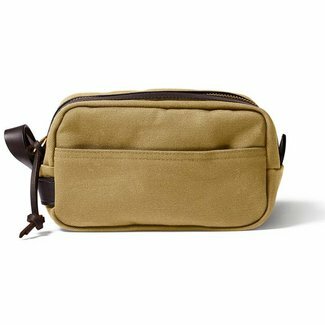 This optimally protects the contents of your Filson bag. 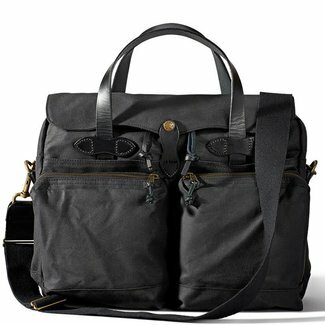 Our collection of men's bags consists of various models. 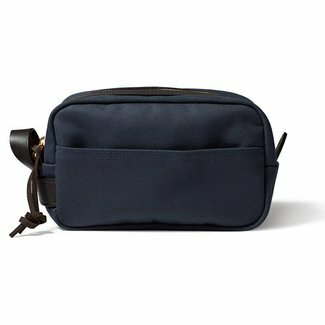 If you are looking for a business bag, the padded computer bag with a lined compartment on the inside may be suitable. You can also choose different types for a good weekend bag. 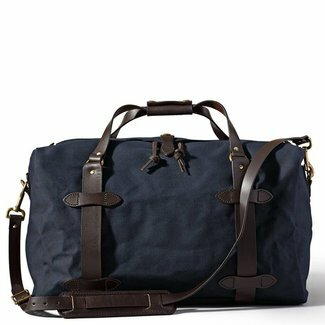 Under the name Filson duffle, you will find different sizes of weekend bags. 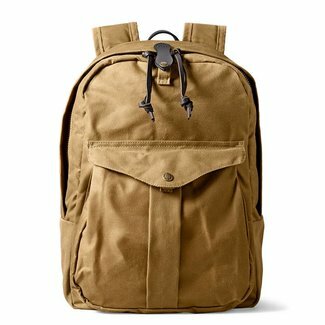 For those who prefer to have their hands free, we recommend the backpack called Filson Journey Backpack. 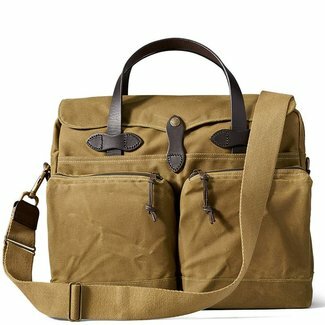 Filson is of excellent quality and is well worth the money. The philosophy of 'making sure it is the best' has never changed. Through the years the brand has continued to develop its products. 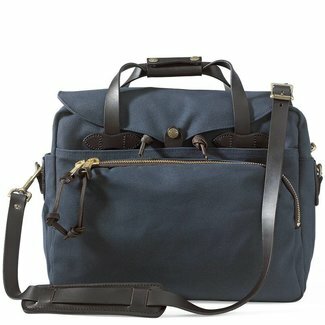 The good reputation that Filson has built over the years, stems from listening to the customer, reliability and honesty. 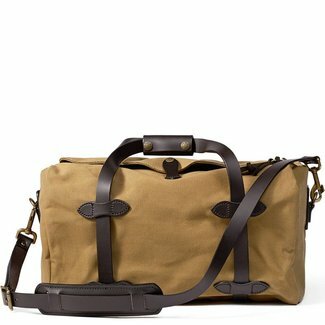 The lifelong guarantee on Filson products also contributes to the good reputation, read more about the conditions here. 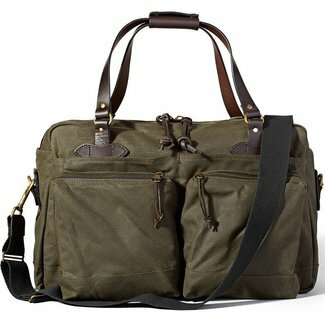 Looking for a Filson dealer? 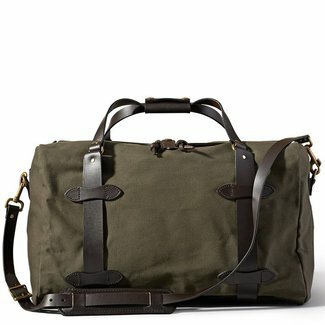 Quality Shop is one of the few to be an official Filson dealer in the Netherlands. 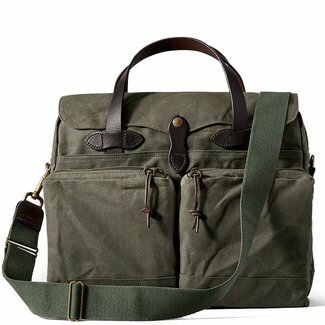 Here, you can easily order the Filson bags online. You benefit from free shipping! If you have questions about the products, or if the desired model is not online, please contact our customer service. 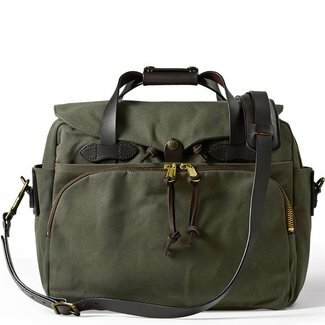 We are happy to help you find the right Filson bag. 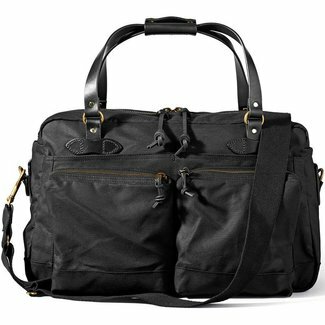 Whether it is about more information about a duffle bag or briefcase, we would be happy to hear your question.